In 1894, a seventh generation Amwell Valley resident, Charles Holcombe, together with a partner, Edward H. Wilson, established Holcombe Funeral Home in Ringoes, NJ. In that era, all funeral services and visitations were held in the family home of the deceased or a church, so the funeral home office was established in Charles Holcombe's home in Ringoes. In 1910, Mr. Holcombe purchased a home on Church Street in Flemington, NJ where he operated the firm until 1934 when he purchased the home at 147 Main Street, Flemington. The funeral home has been located there since 1934 and the firm is now the fifth oldest continuously owned family funeral home in New Jersey. In 1935, Charles Holcombe's grandson, Charles R. Fisher joined the firm and continued to be active until his death in 2000, as did Charles Holcombe, who remained active until his death in 1954. In 1961, Charles R. Fisher's son, who is also Charles Holcombe's great-grandson, Charles Holcombe Fisher, joined the firm and is still active today. In 1996, Robert Fisher Bogart, grandson of Charles R. Fisher and great-great grandson of Charles Holcombe joined the firm, representing the fifth generation of family involvement in the firm. Charles Holcombe Fisher and Robert Fisher Bogart now operate and staff the funeral home. 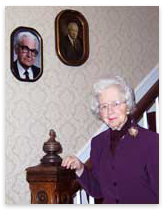 Josephine Oaks Fisher was the Matriarch of the Fisher Family. She was the mother of Charles H., grandmother of Robert Fisher Bogart, and wife of the late Charles R. Fisher. For many years she managed the funeral home office.